Stars: Michael Fassbender, Marion Cotillard, Jeremy Irons, Brendan Gleeson, Charlotte Rampling, Michael Kenneth Williams, Denis Menochet, Ariane Labeb, Khalid Abdalla, Essie Davis, Mahas Varela, Callum Turner, Carlos Bardem, Javier Gutierrez, Hovik Keuchkerian. Cinema is littered with failed attempts to bring popular video games to the big screen, with expensive flops like Mortal Kombat, Streetfighter, Wing Commander, Super Mario Brothers, and even the more recent Warcraft failing to inspire the most ardent of fans. The latest to fail is Assassin’s Creed, which is based on the best selling game from Ubisoft that has sold over 100 million units in a decade and has inspired numerous follow ups and sequels. Despite the popularity of the game, it is hard to imagine too many fans getting worked up about this adaptation which is something of a laboured mess, and a visually ugly one at that. Assassin’s Creed deals with a fictional and ongoing war between the secretive Knights Templar (whom audiences would have encountered in The Da Vinci Code) and another mysterious, secretive order known as Assassins, who usually operate in the dark. The two factions are fighting to gain possession of an ancient artefact known as the Apple Of Eden, an orb that supposedly contains the power to subjugate mankind and bring about the end of violence. Their motivations however are now as pure as they seem. Biotechnology company Abstergo Industries, which is run by the megalomaniacal genetic scientist Rikkin (Jeremy Irons) and his daughter Sophia (Marion Cotillard), father and daughter genetic scientists. Their organisation is a front for the modern day incarnation of the Templars. They have imprisoned assassins and hook them up to a device known as “the animus”, a revolutionary high-tech virtual reality machine which taps into their genetic memories to uncover hidden secrets from centuries earlier. They are using this machine to try and learn the location of the ancient orb. The latest assassin to be hooked up to the machine in Callum Lynch (Michael Fassbender), a convicted killer whose DNA apparently is part of an ancient lineage that dates back centuries. He is rescued from his own execution by Rifkin and Sophia, who have their own agenda. Lynch is forced to relive the memories of his 15th century ancestor Aguilar (also played by Fassbender), an assassin during the time of the Spanish Inquisition, who holds the key to its location. This is the most ambitious and biggest budget film to date for Australian director Justin Kurzel (the dark true crime drama Snowtown, etc), and he brings to the material the same gritty and dark visual aesthetic he brought to his recent 2015 version of Macbeth (which also featured Fassbender and Cotillard). He brings an unconventional approach to the storytelling and narrative structure. The film moves back and forth between the two vastly different time periods, but is something of an uneven and confused mess with overcomplicated plotting. The scenes set in 15th century Spain are the best bits, and capture the energy of the video game origins with some strikingly choreographed parkour-like action sequences involving running and fighting a variety of opponents. These scenes seem to capture the quality of the source material. But they are edited in that frantic kinetic style preferred by most contemporary filmmakers that renders much of the action incomprehensible and too frantic and overwrought. There are some gritty visuals from Kurzel’s regular cinematographer Adam Arkapaw, whose impressive camerawork and superb visual style enhances the dark tone of the material. There are some impressive aerial shots, and Arkapaw provides a different colour palette for the two different time frames – the past is shot in muted brown tones while the scenes set in the present day are given a cold, bluish quality. The film serves up another variation on the classic clash between good and evil, although here the lines between the two extremes are much more blurred and ambiguous. Assassin’s Creed also explores themes of religion, power and control, ambition, memories, technology and science, how the past impacts on the present. These are ambitious themes for what is ultimately something of a mess. And although the assassins are supposed to be a key element of the film we are given precious little information into their background of their supposed creed. Having previously flexed his muscles in the big budget, special effects driven X-Men franchise, Fassbender looks pretty buff here, and acquits himself well in a fairly demanding physical role as the anti-hero of the series. Fassbender was apparently the first choice of Ubisoft, the game’s creators, to play the role of Aguilar. Irons looks bored here, while the likes of Charlotte Rampling and Brendan Gleeson are wasted in small, thankless roles. And we do not forge an emotional connection with most of the characters here. Writers Michael Leslie, Adam Cooper and Bill Collage have taken the essential elements of the game and woven them into this original story line. But there is too much expository dialogue here that slows down the action and will bore much of the audience. Those familiar with the video game will be able to follow much of the action but they will be disappointed with this adaptation, and those non-gamers will not care. 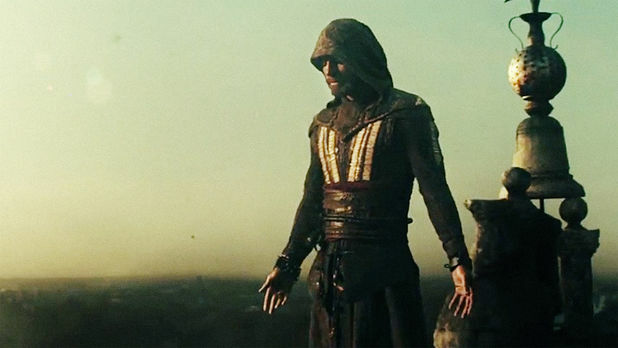 Assassin’s Creed is the first installment in a proposed trilogy, but given its critical and box office reception it may not be developed into a franchise. Assassin’s Creed is ultimately a missed opportunity to kick start another long running Resident Evil-like franchise based on a popular video game.